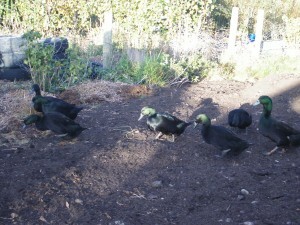 Our lovely black with green and blue sheen Cayuga ducks have produced lots of young. We have various ages for sale. Between $10 and $20 each. We can be contacted at d.askin@scorch.co.newzealand. You know the story with the email address. These are lovely birds- and all the better because they are not so tame that they camp at the back door. Their Mum’s have told them we are nasty folk and so they stay close enough for barley and to look wonderful- but not so close as to be a pain. We really enjoy these birds. Some should really go towards roast duck- we have the pizza oven ready, but not the will! Here is a photo of some of the older birds. and here is a link worth looking at. There is plenty of information about Cayuga’s on the internet.